While in college, my interests in electronics, physics, and photography & darkroom processes had combined into a new interest in x-ray radiography. 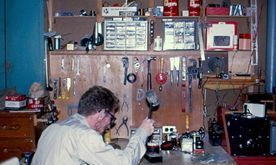 During 1964-68 I collected or assembled the necessary equipment, and produced x-ray radiographs in my dad's home electronics workshop and my basement bedroom/darkroom. I obtained as used replaced equipment from a small medical equipment supply business: two Coolidge tubes, a Lee water cooled line-focus tube, high voltage (HV) transformers, and a mechanical rectifier. I built shielded enclosures and took radiographs of inanimate objects - mostly electronic and mechanical equipment. In the early 70's, some of the stored equipment, film, and notes were ruined in a basement flood, but enough remains available to present here. 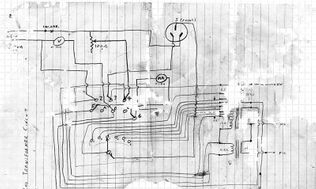 This is a "min-o-scope" miniature 1-inch oscilloscope, which I built in early 1961 from plans in an article by Charles J. Schauers in the August 1960 issue of Popular Electronics (available in pdf format from americanradiohistory.com). The scope uses three vacuum tubes - a 1CP1 scope tube and two 6AU6 tubes for horizontal sweep and vertical deflection. The Bakelite case is 5" x 7" x 2.25". Instead of a chassis for the power supply and terminal board for the main scope circuitry, I used copper clad etched circuit boards for each, laying out the circuits with tape resist for lands and connection points, and etching with ferric chloride (messy stuff). All vertical and horizontal circuit components, including the 6AU6 tubes and four potentiometers (X & Y amplitude, intensity/power, horizontal sweep), are mounted on the main scope circuit board. In the view here, the terminal strip along side provides external access to the X and Y deflection plates and intensity control. Vertical input is at the top , along with a 5 position sweep range selector switch, and a neon lamp power indicator visible through a hole in the case top. There used to be a conical cardboard tube glued to the front to shade the screen, but it has broken off. The unit stopped working about 15 years ago (no horizontal deflection). 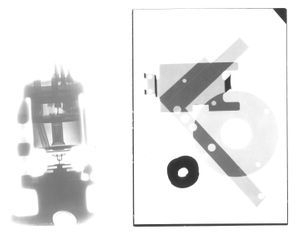 Here is a contact print of an x-ray taken in about 1965-6 of the min-o-scope seen above, using the equipment described below. The front of the unit faces right. The 1CP1 scope tube can be seen in the upper quarter of the photo, along with the neon bulb power indicator and sweep selector switch with attached ceramic disk capacitors. A shielded cable snakes from the vertical input connectors on top. In the left center is the power supply board viewed face-on, with fuse, top-hat diode rectifiers, and cylindrical electrolytic capacitors. At the right center and running down is the main scope circuit board seen edge-on, the view being through pairs of mounted potentiometers and 6AU6's. The power transformer is at lower left. The circular objects just to the right of the transformer and elsewhere are tubular paper capacitors seen end-on. In my x-ray experiments of the 1960's, I used 5" x 7" sheets of no-screem medical x-ray film, coated with emulsion on both sides. 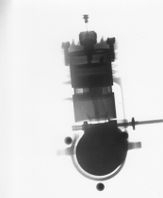 The film sheet was held in a light-tight cardboard cassette (without a fluorescent intensifying screen), and placed perpendicular to the x-ray beam source, against the x-rayed object, with the object between film and x-ray source. 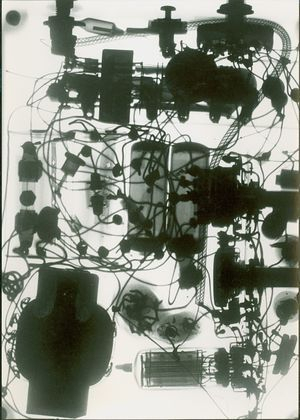 The x-ray film is tray developed and fixed in a darkroom similar to black-and-white film processing, but with chemical solutions particular to x-ray film. These are Coolidge tubes, probably still functional. The one to the rear, made by Victor X-ray Corporation of Chicago Illinois with last marked patent date of Oct 20, 1925, was used to take the x-rays on this page. The tube to the front was made by General Electric Company of Schenectady, New York with last marked patent date of Jan 12, 1917.
angled flat surface intended to direct x-rays generated by the electron impacts out the side of the tube. The GE tube to the Front (above) worked but was set aside as a backup because of some scratches on the bulb and heat damage fissures at the focal area of the anode (see close-up photo to right). The filament is heated by passing an electric current through it - the amount of current is typically manually controlled to determine the filament temperature (red to orange hot) and the rate at which electrons are boiled off (and thus the rate at which x-rays are produced). A high positive voltage is applied to the anode relative to the cathode to cause the electrons emitted by the hot cathode to accelerate towards the anode and impact on it - the higher the voltage, the stronger the impacts and the more penetrating the generated x-rays. The oil-filled x-ray transformer used with the Coolidge tubes above supplies both the high voltage (HV) needed between tube anode and cathode, and the low voltage needed to heat the tube filament. As seen in the left photo, the unit was manufactured by the Kelley-Koett Mfg. Co., Inc. of Covington, Ky. The metal case is about 12" high x 13.5" wide (without handles) x 10" deep; the insulator posts extend up another 6.5". The transformer unit without the detachable center pole weighs about 115 lbs. The peak voltage generated is 85KV. The center pole used to have an insulated cross-member which held three metal pulley-like retractors with wires connecting to the posts, and flexible cloth covered wires wound onto the spring-loaded retractors which could be pulled out and connected directly to the Coolidge tube terminals. The two insulated posts in the right photo provide the HV anode connection (right) and two filament connections with cathode HV also connected (left). The center of the HV winding is grounded to the transformer case. The transformer unit has three controls: a main circuit breaker controlling all power to the unit, a rheostat for controlling the x-ray tube filament current (by controlling the current applied to the filament transformer primary winding), and a 6 position rotary thumb-wheel switch for selecting a HV potential (the lowest selectable potential being around 30KV). There are two displays: a voltmeter displaying the AC input supply voltage when the circuit breaker is on, and a DC milli-ammeter displaying the average current passing through the connected Coolidge tube from cathode to anode (this is not the filament current, but is the current of electrons from the cathode impacting on the anode). The two meters have radium dots on their scales to make them easy to see in near darkness, but their glow-lifetime had expired by the time I got the unit. There are two connectors on the housing to the sides of the meters - the left connector is for the AC power connection; the right connector accepts a cable from a remote control for switching on/off the HV while the filament current is always applied. This ugly looking box had an important function: it let me stand away from from the transformer and un-insulated HV wiring when switching transformer HV power momentarily, and away from the area when leaving the HV power turned on. For my use, I completely enclosed the Coolidge tube in an old wooden console TV cabinet which I lined with sheet lead and provided with a small port on one side for the x-rays to exit. The tube was positioned vertically, resting on its bulb on a wooden shelf with the anode neck dropping through a hole in the shelf. HV wiring to the Coolidge tube passed through the the walls of the cabinet in concentric tubes of glass and plastic, openings shielded with lead sheet, while glass and plastic insulated the tube ends from the cabinet shielding. To take an x-ray, I would first select the HV setting, then switch on the transformer breaker to power the tube filament, which illuminates the angled anode in the tube. I would then position the item to be x-rayed about 2 feet from the tube anode and so that it can be "seen" by the anode through the port in the protective cabinet. I would momentarily apply HV to the tube and check/adjust the tube current (usually about 1ma), afterwards positioning the x-ray film in its cassette close behind the item to be x-rayed. Then I would make the exposure (typically around a minute) using the remote HV positive switch position so I could leave the area during the exposure. After switching off I would check the tube anode for heating (it might be glowing dull red). For longer exposures, I would let the tube cool and then continue with a second exposure time without disturbing the item/film positioning. 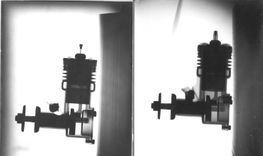 The above photos are contact prints of 5" x 7" x-rays of a model airplane engine lying on a block of wood (to right in each photo). The HV setting is increased in each photo from right to left, thus increasing the penetrating power of the generated x-rays. Taken about 1966. End view of the model airplane engine, lying on block of wood to left. The left image is an enlargement of an x-ray of a small klystron tube. I don't remember the tube type - it was about 3-4 inches tall, black metal case, octal socket, with adjuster brackets along the sides. 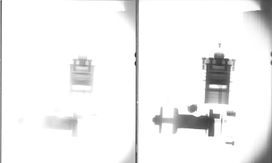 The right image is typical of many exposure experiments - this one is a contact print of a 5" x 7" x-ray at 50 KV at 1 ma for 5 seconds, at 24" inches from anode, through an aluminum filter 2.63 mm thick, developed for 2 minutes at 80 deg F., of an aluminum ring .86mm thick, an aluminum L shape .86 mm thick, an aluminum bracket 1.03 mm thick, and a small lead ring. These were taken about 1966. This is a mechanical rectifier - the plate on motor identifies an "alternating current motor", manufactured by the Holtzer-Cabot Elec. Co, Boston & Chicago. The motor is half-synchronous, turning the solid mica disk with two attached metal connector strips at 1800 rpm. The end of each strip extends just beyond the edge of the disk as seen in the photos, the extensions 90 degrees apart. Clamped to the motor mount just behind the rotating disk is a stationary square of insulator (looks like Bakelite) with a small wire terminal with wire brush at each corner. When the disk rotates, adjacent pairs of terminals are connected by the strips, first the two vertical pairs, then the two horizontal pairs, each revolution. By separately connecting the opposite corners together, we have the essentials of a half-wave rectifier for the HV alternating current - one set of connected corners to the Coolidge tube anode and the other set connected to the HV supply wire for the anode. The main benefit of having the mechanical rectifier in series with the x-ray tube, which under conservative operating conditions does its own rectifying, is to protect the tube. When the x-ray tube relies on its own rectifying, as the anode heats up and becomes red hot or worse, it boils off its own electrons which will impact on the cathode on AC half cycles when the cathode is positive relative to the anode. Since the cathode isn't built to withstand heating due to this reverse current, it can easily be destroyed. The mechanical rectifier protects the tube by switching off the HV on the tube during half cycles when the cathode would otherwise be positive relative to the anode. There is more information about rectification for x-ray use at this power point presentation download link by students of New York Chiropractic College. This Lee x-ray vacuum tube has a water-cooled anode made of copper, with a piece of embedded molybdenum as the target. The cathode is a line-focus filament style. The tube is 2" in diameter and 16.5" long overall; the anode cooling assembly extends 3.25" past the end of the tube glass. From wood, I built a small circular ring clamp suspended on legs attached to a platform. The tube sat vertically clamped at the glass envelope constriction (seen in photo), anode downward through the ring. A lead pipe about 6" diameter and about 2' long enclosed the tube with its clamp and supporting legs, with room at the bottom to accept the cooling water tubing and anode electrical connection. A small hole on the side of the lead pipe at the level of the anode target let the x-rays out. A quart-size cylindrical bottle with the bottom cut off fit over the cathode/filament terminal and the upper part of the tube to insulate the connection (wired via mouth of bottle) from the lead pipe shield. Another HV transformer (other than the one pictured above) without any internal HV connections to the case, and a separate filament transformer insulated for HV were used to power the Lee tube - one end of the HV needed to be connected (through a milli-ammeter) to house electrical ground so the house water tap could be used for cooling water. 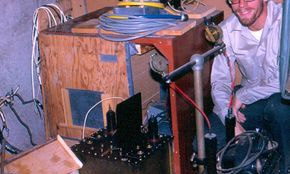 A Variac was used to control the primary voltage to the filament transformer , and a separate autotransformer with multiple taps to the HV transformer primary was used to select a HV level. The mechanical rectifier shown above was used with this tube, connected in series between cathode and HV transformer non-ground end (I was concerned about allowing this tube to self-rectify at high voltages). This configuration was not very practical to set up for use and breakdown afterwards (the cooling water source and workspace was shared with the washing machine). The setup was tried only a few times before I had to pack everything away to storage in preparation for my time away at school and later the Army.